Tucked away beside the Executive Plaza Hotel near Lougheed Town Centre is a small sushi restaurant by the name of Hanamori Sushi. In fact, it is so small that if you come with a party of more than three people, they will have trouble seating you. Last time I visited, I was surprised by the high quality of the sushi (especially the torched sushi) they serve, and that is why this restaurant ended up in my list of favourites. 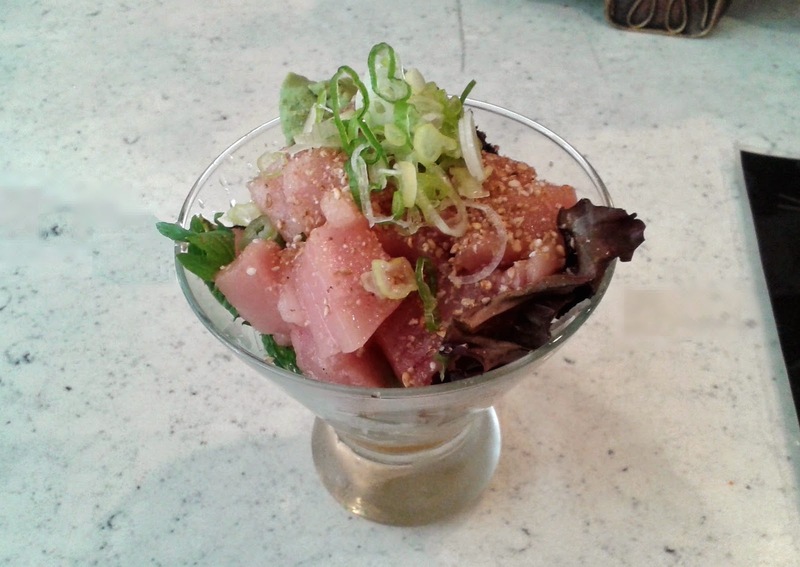 Hanamori Sushi is run by a small team of Koreans and specializes in fusion sushi. They excel at presentation and you can tell that they have put effort into investigating what combination of ingredients works best for each item in the menu. The main chef who works at the sushi bar seems to be a very open person, and lots of customers recognized him by name. All of the tables and the entire bar were filled with customers, and there was even a small line-up for the washroom when I walked in. The first item to arrive was the Tuna Goma-ae. The Tuna Goma-ae was one of the most beautifully presented goma-ae's I have ever had. There was lots of very soft tuna which was covered with a small amount of sesame seeds and fish powder which completely eradicated the metallic taste of tuna. Instead, the tuna was quite savoury and mildly sweet. Salad greens are used instead of spinach in this dish (this still qualifies as goma-ae). The Chicken Teriyaki Roll contained chicken teriyaki and cucumber inside the rice casing. Pepper was sprinkled onto the chicken teriyaki, which gave this roll a more Western feel. The cucumber in this roll worked well, providing relief to the stronger taste of the chicken teriyaki and pepper combo. Unfortunately, the chicken was rather tough, so I could not give this roll an A-level grade. The Thai Salmon Crunch Roll consisted of salmon tempura, cucumber, avocado, thai spicy sauce, pineapple sauce, and torched salmon on top. This roll seemed like a battle of flavours, with the thai spicy sauce being sweet and spicy and the pineapple sauce being sour. Personally, I would prefer this roll without the pineapple sauce as the avocado was a better match with the thai spicy sauce. The torched salmon retained a semi-marbled texture which provided good contrast with the cooked salmon inside the roll. The batter for the salmon tempura was closer to a Filet-O-Fish batter than a tempura batter. At this point of the meal, the sushi chef was very engaged in a conversation with the couple beside me at the bar and made his first major mistake. 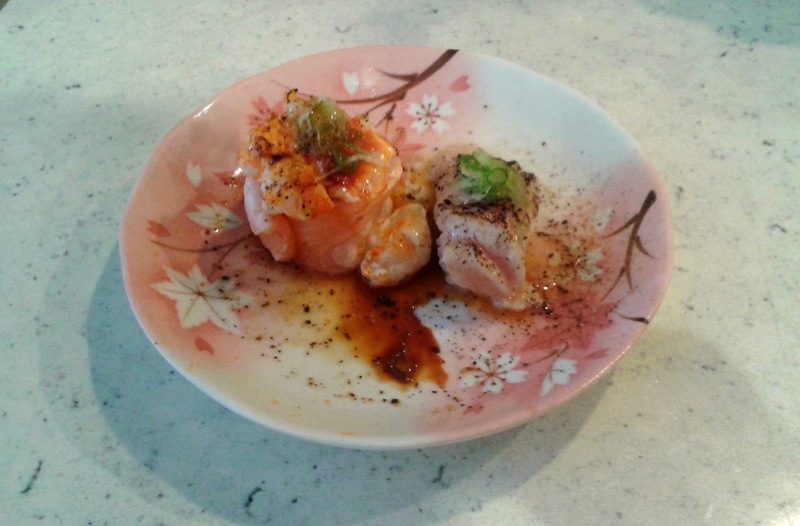 The two pieces of nigiri were placed on the same dish, while the sauce was only meant for the Aburi Wild Salmon Nigiri. By the time the waitress brought the dish over to me, the sauce had bled over and contaminated the Torched Toro Nigiri. Eek! The Torched Toro Nigiri was masterfully seared and melted in my mouth with a lightly charred taste (this is a good thing) as I ate it. The sauce contamination made the sushi rice overly salty and wet, and as a result, I regrettably had to lower my rating for this otherwise amazing piece of nigiri by a full letter grade. The Aburi Wild Salmon Nigiri also contained chopped scallop (this was stated on the menu) and the similar textures of each combined with a creamy, slightly sweet taste worked well. The sauce for it was quite salty and sour and was too strong, which distracted my ability to properly taste the nigiri.